There is no deposit guarantee scheme in Cayman Islands. Local currency (Cayman Islands dollar) deposit ceiling for Cayman Islands is set to Aa2 (high grade), foreign currency deposit ceiling is Aa3 (high grade). Currently there are 149 credit institutions operating in Cayman Islands. In 2016 consolidated banking assets in the Cayman Islands were 1,035.66 bln USD. The consolidated banking assets' evolution is shown at Chart 1 below. Chart 1. 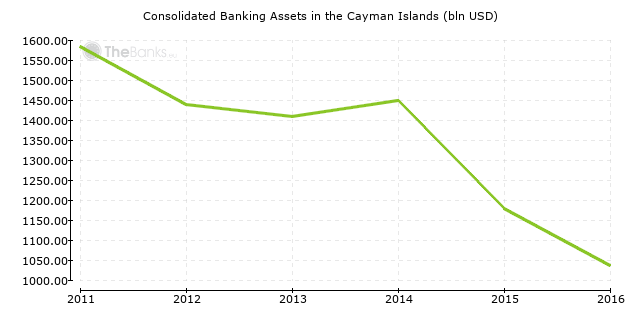 Consolidated banking assets in Cayman Islands. All the credit institutions operating in Cayman Islands can be classified into several categories. Table 1 summarises the number of banks in each category. Table 1. Number of banks by category in Cayman Islands.